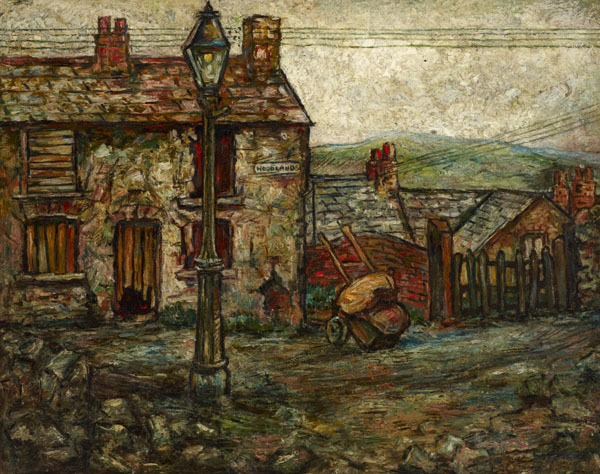 Sochachewsky visited the Welsh village of Tal-y-Wain and the Monmouthshire colliery in the mid-1930s. Although this atmospheric depiction of a crumbling house in the Woodlands area is unpeopled, he also painted numerous portraits of the miners and their families, living in one room in a miner's cottage in a village near Pontypool for eight months and observing the hardship of their lives at first-hand including a shift in the colliery. After the Second World War he illustrated two books by the journalist and writer Theo Lang including 'Cross Country' (1948), which describes a journey from Lands End to John O'Groats and includes drawings of the Welsh miners.